the feet.. not easy” -- Tim Sheridan. Switching from jackin house to tech-house, to dirty electro, Filthy Rich delivers perfection on the decks time after time. A multi-dimensional artist, his hit productions are signed to CR2, Toolroom’s Leaders label, Big Love, Nervous, Audio Damage and Dutch imprint Spinnin. Rich has clocked up an electrifying discography of over 50 productions and re-mixes with support from the likes of Steve Lawler, Tiesto, Carl Cox, Peter Gelderblom, Sidney Samson, and Seamus Haji. 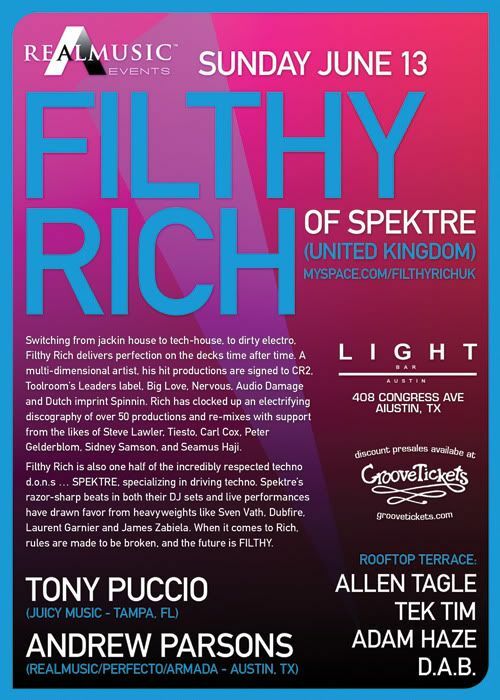 Filthy Rich is also one half of the incredibly respected techno d.o.n.s … SPEKTRE, specializing in driving techno. Spektre’s razor-sharp beats in both their DJ sets and live performances have drawn favor from heavyweights like Sven Vath, Dubfire, Laurent Garnier and James Zabiela. When it comes to Rich, rules are made to be broken, and the future is FILTHY.